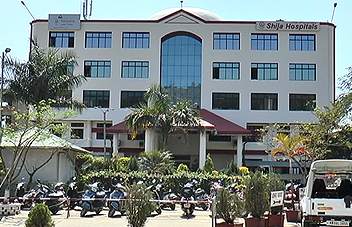 Keeping pace with the rapidly evolving high end minimally invasive techniques all over the world, Shija Hospitals performed painless “pin hole procedures” to stop fatal bleeding from kidneys for the first time in Manipur. The ever so sophisticated advanced technique without open surgery is performed at the state of the art Cath Lab facility in Shija Hospitals by Dr. Thangjam Gautam Singh, Consultant Interventional Radiologist. He further informed that a total of 5 cases has been done successfully so far. Explaining the procedure, Dr. Th. Gautam elaborates that traditionally open surgeries were done for various diseases such as Renal aneurysm (bulging of artery inside kidney) and Renal Arteriovenous fistula (AVF - abnormal communication between artery and veins inside kidney) in the bleeding kidneys and sometimes led to removal of kidneys to save lives of the patients. Now, with Interventional Radiology, through a needle puncture in the groin, the blood vessel causing bleeding inside the kidney is closed using coiling and embolization. This saves the patient from life threatening condition and also saves him from losing a kidney. Patient is also saved from severe pain, prolonged hospital stay and unnecessary medication. He also added that similar procedures has been performed at Shija Hospitals for bleeding of most organs of the body such as bleeding in lungs (Bronchial Arterial Embolization), bleeding in intestine (GI Embolization), bleeding in uterus (Uterine Artery Embolization, bleeding in abdomen (Aortic Aneurysm Embolization), etc. Shija Hospitals & Research Institute (SHRI) Pvt. Ltd.